A Thanksgiving day fire displaces 7 tenants on Dry Hill Road. The Montague Center Water District commissioners address recent concerns. 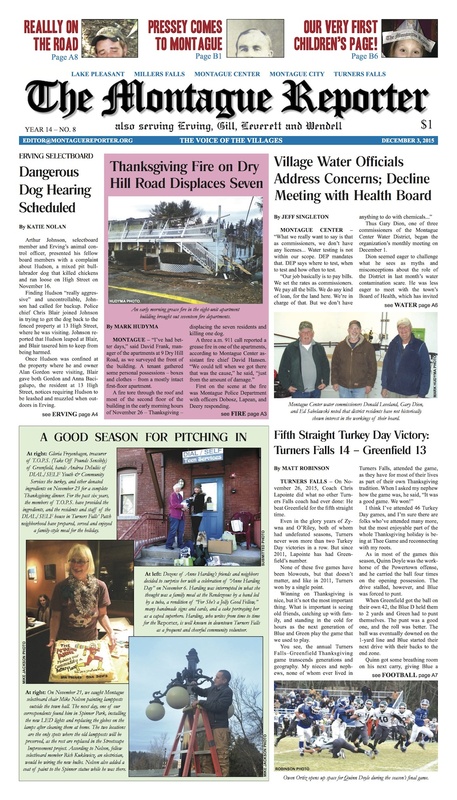 Dangerous dogs occupy selectboards in Montague and Erving; plus, full selectboard coverage from all five towns. TF football scores a fifth straight Thanksgiving victory. Neighbors pitch in and celebrate one another. Our editorial advocates for spending holiday dollars locally, while letter writers weigh the relative threats of U.S. gun violence and ISIS and urge readers to check out Citizenfour. MoRe: Our first ever Children’s Page! Part 1 of a look back at Montague’s Clairvaux Arts and Crafts Society. Welcome Yule comes back to the Shea. Our writers celebrate holiday gatherings and rituals. The Wendell Free Library hosts paintings by Mari Rovang. The Healthy Geezer dispenses advice on canes. 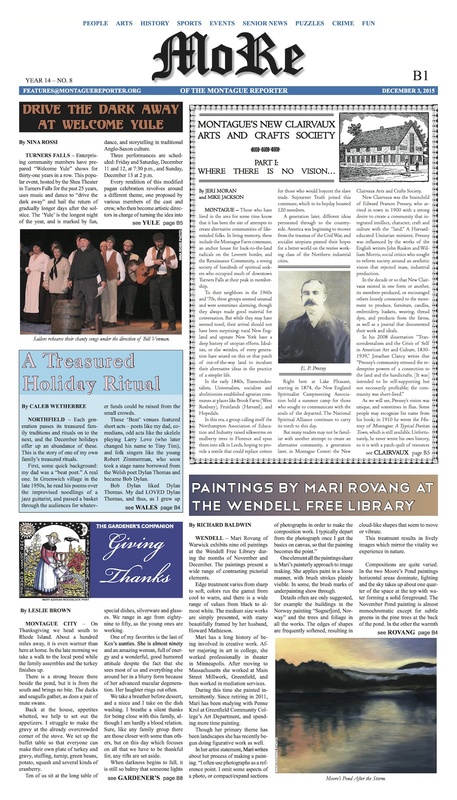 Plus: Weird Healing; Pet of the Week; a bonus Pet of the Week alumni success story; arts and event listings (including holiday bazaars); police logs from Montague and Erving; and so much more. Well worth the two week wait! Grab your issue today.